This photo shows the power-generating ability of Galfenol being tested by the Split-Hopkinson Pressure Bar. A cylinder of Galfenol is inside the electromagnet, sandwiched between the Hopkinson bars. Image: John Domann/UCLA. By converting mechanical energy into magnetic energy, an alloy consisting of iron doped with the metal gallium, first made nearly two decades ago by the US Navy, could form the basis for wireless impact detectors. In new experiments, researchers from the University of California, Los Angeles (UCLA), the University of North Texas and the Air Force Research Laboratories have shown that the alloy, dubbed Galfenol, can generate as much as 80 megawatts of instantaneous power per square meter under strong impacts. The team describes their findings in a paper in the Journal of Applied Physics. Galfenol is a magnetoelastic material, meaning that its state of magnetization can be changed by squeezing, pushing or otherwise deforming the material. Conversely, when exposed to a magnetic field, magnetoelastic materials respond by changing shape. If the materials are prevented from deforming – for example, by being held in a clamp – they will instead generate a large force. 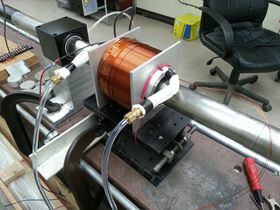 Significantly, this magnetoelastic effect can be used to generate electricity. “If we wrap some wires around the material, we can generate an electrical current in the wire due to a change in magnetization,” Domann said. As described in the new paper, Domann and his colleagues assessed the power-generating ability of Galfenol in experiments using a device called a Split-Hopkinson Pressure Bar to generate high amounts of compressive stress (e.g. powerful impacts). They found that when subjected to impacts, Galfenol generates as much as 80 megawatts of instantaneous power per cubic meter. Among the potential applications, Galfenol-powered devices could be used as wireless impact detectors. “Essentially, we could fabricate small devices that send out a detectable electromagnetic wave when a mechanical pulse moves through it,” Domann said. These devices could be embedded in vehicles – military or civilian – to detect collisions. Because electromagnetic waves travel three orders of magnitude faster than mechanical waves, information about the impact could be transmitted ahead of the waves created by the impact. “In this manner, we could wirelessly determine that an impact has occurred, before the majority of the vehicle (or any passengers) even have time to feel it. This would allow a fast computer to take actions mitigating damage or injury,” he added. Although the concept requires further analysis and testing, commercial technologies based on the idea could see the market within just a few years, the researchers said.